Dust 514 is the latest game from CCP, producers of EVE online, the persistent online Sci-Fi MMO. 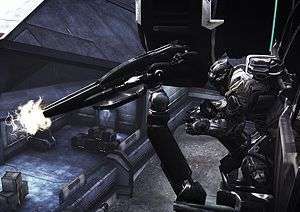 The game brings an FPS element to the universe on the PlayStation 3, allowing players to directly interact with the EVE universe through multiplayer FPS matches. In Dust 514, everything you do will affect the economics or politics in EVE. In EVE the player took the on the role of one of the immortal pilots, moving from clone to clone as they were killed. This theme carries across into Dust 514, where the player is an immortal mercenary, being reborn into clones as they are mown down on the battlefield, only to be re-kitted and redeployed. I got the chance to sit down with the Dust 514 team and have a look at the game in its current state. The game at its core is an incredibly polished looking first person shooter, mixed with some minor RPG elements. Players will create their character just like any other MMO, deciding their faction from the multiple factions of EVE online, The Gallent, Caldari, Ammar and Minmatars. When you first start the game you will create a character and enter your own private mercenary living space, similar to that of the captain’s quarters of EVE. Here the player will have access to all of his equipment, his load outs and skill trees. You will also have access to the marketplace. This is one of the main areas where Dust 514 ties into EVE, whereby players in EVE online will provide many of the weapons, armour and vehicles in this marketplace, which can then be bought for ISK or AU, the in-game currency. It was also very interesting to see that much of the menu system in the game is drawn from EVE, which should mean that it should be very familiar to veteran players of the MMO. Abilities in the game are unlocked through skill points earned for taking part in battle and for doing particularly well in combat. These skill points can then be spent on attributes that allow the player to fit out their armour and vehicles with ever more powerful modules. In fact, armour and vehicles in Dust are fitted much like they are in EVE. Players will have access to their power armour, which comes in a variety of shapes and sizes and will be able to modify these to make them more durable, faster or carry more ammo etc. Players can, for example, select light scout armour and fit this out to make the player run even faster than they normally would. This fitting system also applies to the vehicles, where tanks can be given additional armour, shields or firepower. 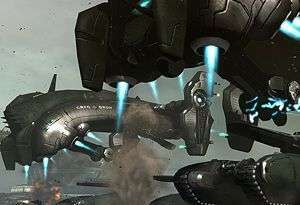 Many of the modifications are pulled more or less from EVE online, so players of the MMO will be familiar with the heat sinks and shield rechargers. The suits of armour and vehicles are also limited by how much CPU and power a module requires, helping balance gameplay. A player in scout armour may be able to run faster, but they won’t then have the CPU or Power capacity to add armour mods. The developers are excited to see what the players do with the fitting system and anticipate a huge amount of fitting development from the community. Another interesting feature is that when you die, you lose all of your equipment, in a very similar fashion to EVE. This isn’t your regular FPS, however, as death can be a financial burden to an immortal mercenary, and equipment lost on the battlefield is lost forever. This means that before you enter battle you have to ensure that you have the required number of weapons purchased from the marketplace. 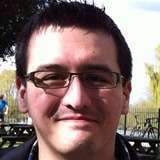 The developers also hope that it will make the FPS combat a little more tactical. The matches themselves are twenty four players a side; the maps are pretty massive in scale and incredibly detailed. Each match is contracted by players in EVE. Dust 514 players join games through the war room, where players in each team can meet and form into squads before deploying to the planet. The only match type we saw on offer consisted mainly of the point capture type gameplay FPS gamers will be familiar with from games like Battlefield 3. Players deploy to one standard spawn point, or directly to a dropship, which can be bought and piloted. The game then revolves around capturing points and secondary objectives such as turrets to push the enemy back and whittle down their ticket counter. Dust 514 is built using the Unreal engine and looks incredibly pretty. A lot of attention has been paid to the level of detail, which really does make it a contender against other games like Call of Duty and Battlefield. I’m not a huge FPS fan but I could see myself picking this up when it releases in Q3 this year. In the menatime, the game will have a more open beta later in the summer. where did you get the Q3 from? Details were given by the developers at E3.